Click the relevant button in the main interface to open the sign-in button. Players can sign in once a day to obtain the reward of the day. If your VIP reaches a certain level, the reward can be doubled. 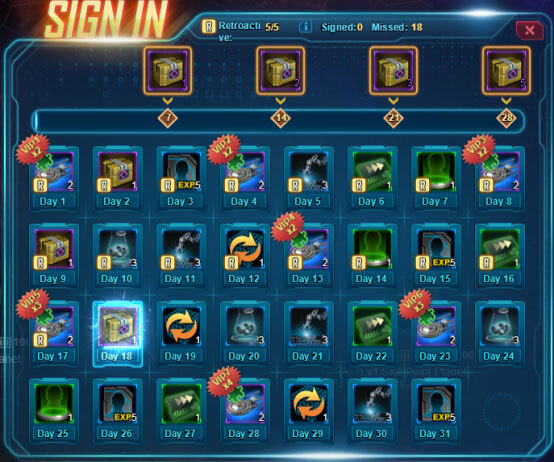 When players sign in for 7 days, 14 days, 21 days or 28 days in a month, they can claim a sign-in chest to receive extra rewards. If you miss the chance to sign in one day, you can use Credits to remedy for that day and claim the reward. There is a limited number of remedy chances every month. The higher the VIP level, the more remedy chances you can have.